While specific statutes on child support will vary some from state to state, all jurisdictions must abide by the federal child support enforcement laws. If you pay child support and are hurt on the job, it is important to know how your workers’ compensation may be affected. Child support is calculated on the nonresidential parent’s earnings. For enforcement purposes, earnings will include certain income replacement programs such as Social Security Retirement Benefits, Social Security Disability Insurance, and Workers’ Compensation Insurance. In 2006, a new law authorized state and federal child support agencies to gather information about insurance claims. As a result, the federal child support office partners with the insurance industry and receives information on all claims filed by, or on behalf of, anyone with past due child support. This is called the Insurance Match Program. If you are behind on your child support, the state agency will receive notice of your workers’ compensation claim. Typically, the state agency will file a lien on any lump sum settlement you may receive from your injury claim. The garnishment will be in the amount you are behind at the time the lien is filed. If your lump sum award is less than the lien amount, the enforcement agency will take your entire award. Also, if you receive a monthly payment from workers’ compensation insurance, child support payments may be withheld up to the state maximum, usually fifty percent. A good workers’ comp lawyer can help you with the child support maze. Be completely honest with your attorney about your child support and if you were behind in your payments before your accident. If money was coming out of your paycheck, let your attorney know. Your attorney is obligated to give the state agency accurate information about your employer’s policy. 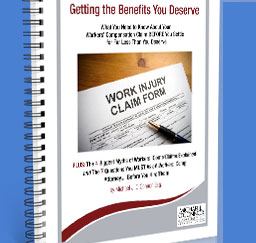 Even though a lien will go in place, this information can save you from having to go to court and testify about your workers’ compensation claim. Your attorney may be able to help you slow down enforcement by helping you get good letters from your workers’ comp doctors detailing your injuries and ability to return to work. In some states, if your injury left you completely disabled, you may be able to stop the enforcement. Your attorney can help you in the enforcement action by providing you with letters detailing the status of your workers’ compensation case. When a lien is in place, the state agency may relax enforcement if they know your case is being diligently pursued. A workers’ compensation attorney can be an ally in your child support case as well as an advocate in your injury case.